Dendrochilum abbreviatum Blume 1825 SUBGENUS Platyclinis SECTION Platyclinis [Bentham] Pfitzer TYPE for the section Photo courtesy of Copyright © 2002 All rights reserved. Found in Java in primary forests at elevations of 700 to 2000 meters as a small to medium sized, hot to cool growing epiphyte with oblong, dark green pseudobulbs with large, acute gradually narrowing below into the petiolate base leaf that blooms in the spring and summer on a undeveloped pseudobulb before the leaf emerges, 10 to 13" [25 to 32.5 cm] long, many [25 to 35 flowered inflorescence. 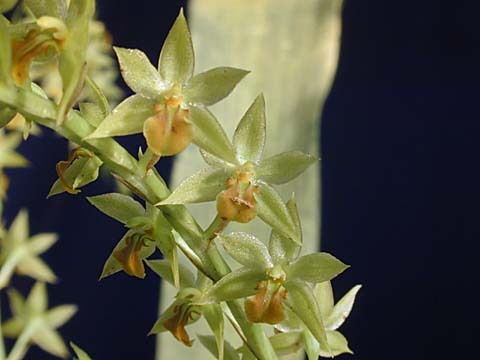 The orchid in the photo is Dendrochilum abbreviatum var reniformis.